Packing tips for the frugal traveler. What items do you typically forget when you travel? For me it’s toiletries and beauty products. I usually find myself in a CVS soon after I arrive. My friend Heidi is a frequent, frugal traveler and she keeps a separate set of toiletries always packed. This is a smart packing tip for frugal travelers. Stock up on travel sized toiletries when you find them on sale and just leave them packed in your suitcase. When you get beauty freebies and samples, you can also put these aside to use when you travel. I read that two of the most forgotten items are sunscreen and bug repellent. My husband made a master list of travel items he needs and keeps it on his smart phone. Many airlines charge for overweight bags and second bags (both ways) so proper packing is imperative for the frugal traveler. Try sticking with one color scheme so that everything can be mixed and matched. Savvy packers recommend planning your outfits around your shoes and limiting the number of shoes that you bring. If you arrive without the proper jacket or if the weather is different for what you packed for, head for the local thrift store such as Goodwill to find what you need. I keep a set of winter clothes at my Mom’ s house in Connecticut that I purchased at a thrift store. There is no need to lug my boots, heavy coats, and winter clothing back and forth from California. If you plan to do laundry on your trip, pack a little laundry detergent, or a few laundry pods in a zip lock bag. Buying laundry soap at a laundromat is always at a high mark up. Pack snacks such as granola bars, instant oatmeal, nuts, and trail mix that can tide you over if you have a long layover or get in late at night. Keep medications in your carry on in case your baggage gets lost or delayed. I stop at Trader Joe’s before a flight and stock up on food for a meal on the airplane. It is healthier and cheaper than options at the airport. You can make a cooler in your hotel room with a trash can, a plastic bag, and some ice from the vending machine. Stop at a grocery store when you arrive and buy some fruit, cheese, bread and a few other staples so you can have some meals in your room. I always pack extra zip lock bags in my suitcase and find many uses for them while traveling. I am usually working when I travel and bring a laptop, an iPad and a smartphone. I have a small power strip that I bring with me. Often there are not enough outlets in a hotel room or they are placed in an awkward spot. 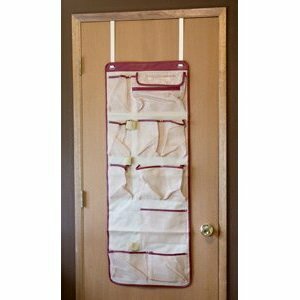 When traveling (especially with the family) pack an over the door organizer. You can use it for keys, medicine, sunscreen, gadgets, chargers, tickets and much more. Think how organized you will be! No more digging around everybody’s suitcases to find those items you need.